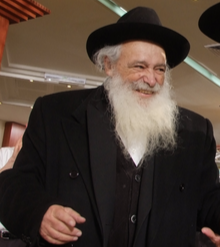 Rav Avigdor Nebenzahl of the Old City of Yerushalayim in engaged to be re-married at 83-year-old K”AH, Bechadrei Chareidim is reporting. Rav Avigdor’s first wife, Rebbitzen Shifra A”H was Nifteres three years ago in Adar 5776. Rav Avigdor’s Kallah is Mrs. Chaya Leah (Lily) Galandauer, a cousin (daughter of his aunt) who lives in England. The Rav’s Talmidim were overjoyed at the news and wish the couple Arichas Yomim and many happy years together. May each and everyone seeking to get [re]married, without any exceptions, all also merit to get [re]married during 5779. The nikeivah form of the VERB niftar, is niftarah (not nifteres). So she was NIFTARAH three years ago. Nifteres, on the other hand, is the nikeivah of the NOUN niftar. Goldner is not her last name, it is Galandauer. The Chofetz Chaim and the Ribnitzer Rebbe, among many others, also remarried late in age. 147 I’m glad you prefaced your comment with “seeking”. However, their are many people, who should not remarry and in fact should not have married to begin with. You say “without any exceptions”, really? Shuali,”nifteret” is also the present tense of “lehipater” in the first person feminine. However, the writer apparently meant to use the past perfect tense, in which case it would be “she was niftara”. However, this is incorrect as he is not relating it to another past event. Therefore, it should have been “she niftara”. This shows how problematic mixing languages with different grammatical rules can be. Why not just “she passed away”? There’s a fascinating and instructive story about how her father survived the war. He was a lawyer in Frankfurt (having learned in Slobodka) and a few weeks after the Nazis yemach shemam came into power, he was on his way into the court building when the elevator operator (anyone still remember pre-pushbutton elevators, which obscelesced in the 50s and 60s) told him, “You know there’s a warrant out for your arrest, you’d better disappear fast.” “Thank you very much for telling me, but I’m sure you realize that you could get yourself arrested for warning me, why are you sticking your neck out for me?” “Listen, every time you come in here you give me a smile and a friendly word. Everyone else here treats me like pure dirt, you’re the only one who ever makes me feel human. Gei gezunterheit.” So he caught the next train to Belgium where he sent for his wife and three-week old daughter (the kallah’s older sister, from whom I heard the story decades later) and then spent the war in Stockholm, where he started the Vaal Hatzoloh that got quite a few Jews out of Germany. One of them was Rav Wolbe, ztl, whom I heard say a hesped at his almana’s levaya in Tamuz 5759. Rav Nebenzahl also spoke and his father was mekabel tanchumim from the olam. Shammai says to great everyone with סבר פנים יפות, a pleasant countenance (Avos 1:15), you never know when it can save you and many others besides. tschoumi – at that age many women don’t like having their age publicized. In any case, she’s an old friend of my wife’s and a lovely lady and they deserve to have a beautiful life together. I prayed @same Shul as the Bride for many years; The family are very Choshuv, and I know them over 1/2 century. Por, there is a similar story in Chassidic Tales of the Holocaust about a rav from Danzig. The German laborer whom he always wished a good morning and called “Herr Muller” sent him to the good line at Auschwitz. @Avi K: I am quite certain the Herr Mueller story was with HaRav Yisroel Spira (The Bluzhever Rebbe), but an amazing story either way. It’s really a Gemora, as the Gemora says, among tje answers to “ba’meh arachta yamav”, is that the Amora was makdim Shalom to every person he met, even to a non-Jew. Shuali, it was Rabban Yochanan ben Zakkai (Berachot 17a) but that is not given as a reason for his long life. Rav Ada bar Ahava gave several reasons for his long life but not that (Taanit 20b).